This really doesn't need an introduction, one of the most iconic and important effect pedals to have ever been produced and an essential part of Jimmy Page's tone on at least a couple of well known Led Zeppelin albums. If you don't have one then just build it. Get a measured set of PNP germanium transistors to get the most out of it. If you are using lower gain transistors reduce 100K Q2 collector resistor, maybe consider a trimmer instead to fine tune. Any suggestions for (common) transistors? 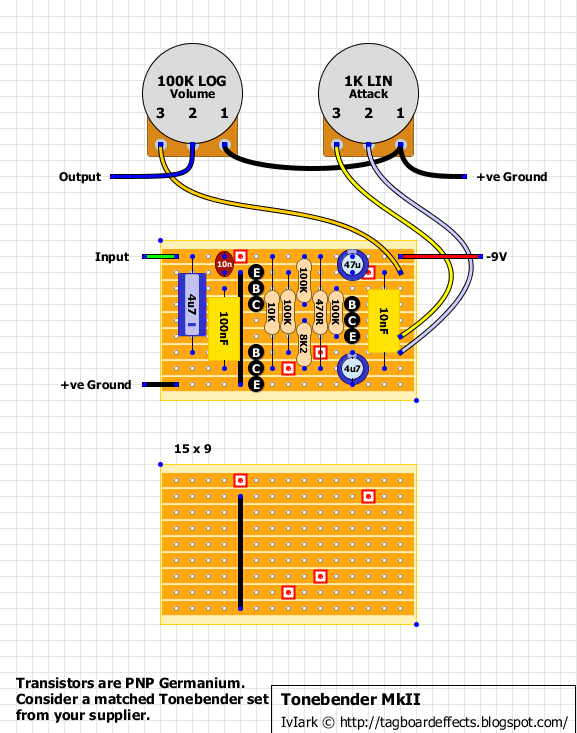 Could I just reverse the wiring on the dc jack so that I can use a regular powersupply? You can get a measured Tone Bender set from Small Bear which would be great for this, but you're in Europe aren't you? Maybe try Musikding because I know they sell germanium in specific gain ranges (try to get 1 around 70-80 hFE, 1 around 80-90 and 1 around 120). I've got an NPN version of this layout which I will post, but bear in mind that it is much more difficult to get good NPN germanium transistors than PNP. I bought two sets of Russian germaniums, which were the complimentary NPN and PNP pair (GT402B and GT404B). With the PNP ones only 2 out of 50 had excessive leakage. With the NPN ones 29 had excessive leakage and most of the others were pretty bad too. The only decent NPN germanium transistors I've bought in larger quantities were MP38A's, and all 50 were reasonably low leakage. Unfortunately they didn't get very high gain though and ranged from around 50 to 90 hFE. This allows you to keep a zero volt ground and so daisy chain with all your usual effects. So if I want to use the OCL7660S to invert the power, does the small link that goes to the second last row provide the -9V for the circuit? So I'd just add that bit to the tonebender circuit in the same way as that? So this one is verified? I have a B2k and an A1K but no B1k's, what should I do. How finicky is the attack knob? Ok I have built this, and it is not working, is Q3 suppose to have that funky layout BCE? Yes. These are germaniums with the triangular pinouts (usually) and so it's easy to accommodate any pinout required by just rotating the body. BCE for that last transistors allowed the surrounding passives to be placed in a more appropriate way to keep things neat and tidy, and so I went with that pin arrangement. This is really must for any fuzz fanatic or anyone seeking those classic 60/70's sounds. I die some swapping with the germs, oc75 wasn't the ticket for me, ac128 was slightly better and finally ac151's brought this circuit alive. Brings insane amounts or boost and massive amounts if nasty fuzz with a real refinement. If im using a regular power supply but wired it according to GGG's pnp wiring... Do I need to reverse the electrolytics? No the layout is designed for PNP transistors and a positive ground, so if you've used the PNP offboard wiring that is correct. Hmm, I'm extremely gated, I'll come back to it later. Did you measure the transistors, have you socketed them, and do you have any others you can try? Tonebenders can be touchy about the transistor gain, and if it is gated then swapping the 8K2 resistor for a 10K trimmer so you can bias Q2 more critically can be a big help. Prefer this over the NPN mindbender, more sustain and most transistors "work". Using 2n404 (Q1) & mb16. It can be noisey depending on the transistor. Getting around 8V on Q3 C with a 10k trim for the 8k2. That's MP16bs, which have lower gains than my 2n404s. I've gone to the Russians for all 3 transistors. Ok stupid question, but I can never get my head around it properly. I got a matched set of transistors and am ready to wire this up. If I'm not going to daisy chain it and am going to supply it with an isolated or battery, do I just wire this like normal? I.e., is my positive lead the 9v? Or is my positive lead the ground (since it's floating on an isolated supply)? What gauge is the hookup wire and where can I buy it? What gauge is the two conductor shielded wire and where can I buy it?